Qualtape Australia Ltd offers a unique range of masking tapes designed to eliminate the typical limitations of conventional tapes in render masking applications. Masking tapes traditionally used by painters and decorators have serious limitations when used in conjunction with most render and texture finishes. Crepe based paper tapes do not possess the structural strength or the weight of adhesive to form an effective bond with rough, complex surfaces such as brickwork and concrete during render masking. Tenacious Tapes has now sourced products that better meet the needs of tradesmen applying various finishes used for sealing, texturing and colouring concrete and brickwork. Specially developed to meet the specific needs of the render industry, K180 blue cloth render masking tapes are fast becoming a preferred accessory in the application of all types of textured finishes. When masking glazed windows, tapes at least 48mm in width should be used with half the tape applied to the top edge of the PE sheeting that has been roughly cut to shape. 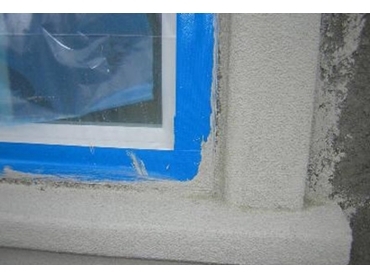 The exposed part of the tape should then be applied to the window frame along the edge that will delineate the limit of the render finish. Firm pressure should be used when applying the tape to ensure that the adhesive is in total contact with the underlying surface, while also ensuring that the textured finish does not bleed underneath the masking tape.